San Diego retailer Alma Music & Audio, D’Agostino Master Audio Systems, and YG Acoustics teamed up in mid-November to demonstrate what can only be described as a mega-system. I attended the event as was treated to some of the best music playback I’ve heard. 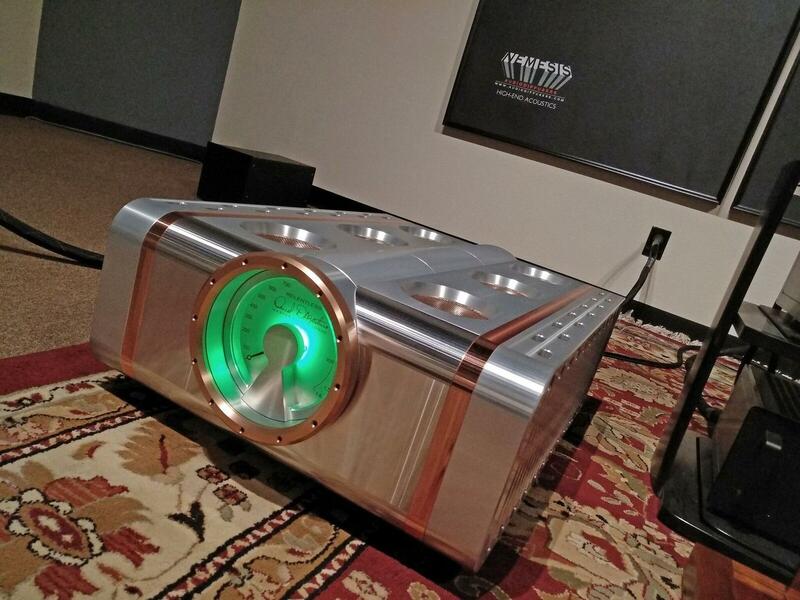 Dan D’Agostino was on hand to showcase his latest creation, the Relentless monoblock power amplifier. This all-out assault on the state of the art in power-amplifier design can output 1500W into 8 ohms, doubling that power into 4 ohms. Significantly, the first 100W of that power is delivered in Class A. The Relentless drove YG Acoustics’ $265,900 flagship Sonja XV speaker system, which builds upon the successful Sonja 2.3 and consists of four towers (two per channel) weighing 463 pounds each. The XV turned out to be the perfect partner for the Relentless. Some of the “magical moments” I have experienced at audio shows or product release events—ones that transcend the usual electro-mechanical exercise—have been with YG speakers and D’Agostino electronics. Each XV has a total of ten drivers per channel, four of which are woofers along with three mid/woofers. All those large drivers help move enough air to produce sufficient bass output and extension in large spaces. Also, the Sonja XV was the first speaker in the Sonja series to include YG’s unique BilletDome tweeter, which combines a treated soft-dome membrane with a very strong, lightweight, acoustically transparent supporting “air frame” to create a new kind of tweeter that has the strength of a metal dome without the metallic “ringing” often associated with hard domes. The rest of the system was composed of the following gear: MSB Select II DAC/preamp ($116,000) or an Audio Research Reference 10 preamp ($33,000) being fed by the MSB DAC, Innuos Statement Music Server ($13,750 with 1TB), Kubala-Sosna Realization Series cables ($60,000), GigaWatt PC-4 EVO Power Conditioner ($12,000), and YG Acoustics 1.6 Rack ($26,400). I listened to either the MSB Select II DAC/preamp or the Audio Research Reference 10 preamp, with equal listening time between them. There was also a complete phono rig on hand, but I didn’t get to hear it: Bergmann Galder Turntable w/ Odin Tonearm ($35,600), Air Tight Opus 1 Cartridge ($15,000), Dan D’Agostino Momentum Phono Stage ($29,000).